The right plant in the right light. This is our goal when preparing a proposal for a client. Choosing a plant suitable to the light available in a particular location results in years of trouble free maintenance and a happy client. We expect our plants to stay green, full and healthy for years. But what is the right light? Remember that even what appears to be very bright indoor lighting pales in comparison to the light available to a tropical plant in its natural outdoor habitat. When we place tropical plants in offices we are expecting them to not only live, but thrive in very unnatural conditions. Low light is the most significant issue. Many offices have little natural light, and what is available is often diminished by heavy filters on building windows designed to cut heating and cooling costs. The light appears to be bright, but the UV light critical to plant health is drastically reduced. This light is often further reduced by window coverings. For comparison, the intensity of light outdoors on a bright sunny day can be in excess of 100,000 lux or footcandles. Indoors 10 feet from a window, this will drop to under 100; even less from a north or east window. Artificial lighting is usually well under 100 footcandles, and we must consider that over the weekends when the office is empty, this may fall to zero. Two out of seven days represents nearly 30% of a plant’s life spent in the dark! Light is the driving force for photosynthesis and therefore essential to plant survival. Plant rooting, growth and development are influenced by the quality and consistency of light. So how do we do it? We take great care is assessing the amount of light in the areas you would like to have plants. We will ask questions about censored lighting, window coverings, and how the room is used. Fortunately, the plants that are supplied to us by quality growers have been acclimated to lower light conditions prior to arriving in your office and many varieties will do well in typical office environments. Smaller plants require less light than large trees. Desktop and hanging plants are a great solution for areas set back from windows. We can use smaller plants in tall containers to acheive the illusion of size. No plant will survive total darkness. 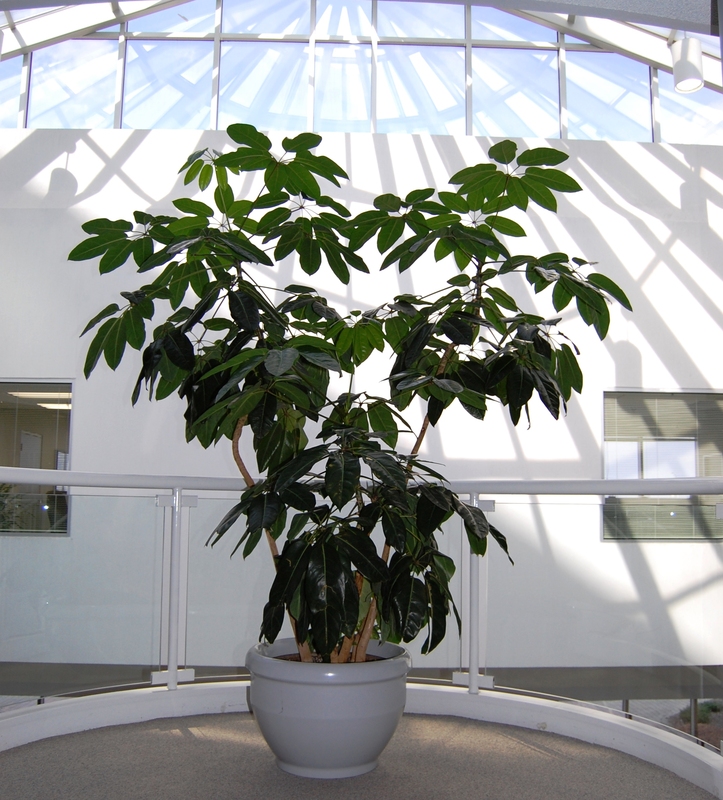 For areas such as boardrooms that are used infrequently and are often windowless we would suggest using a high quality artificial tree. Many of the plantscapes we design are a mixture of live and artificial plants. A quality interior landscape contractor has the experience and education to ensure that the plants suggested for your office plantscape will stay healthy and give you many years of enjoyment.